The farm of Montalto, owned by the same family along five generations, has an extension around fifty hectares covering vineyards, olive yard, orchards and forest, which, altogether, appear as a magnificent mosaic in the landscape. Being part of the wide viticultural region of Lisbon, the 15,5 hectares of vineyards planted in clayey-chalky soil and benefiting from an excellent solar exposure, enable the production of wines classified as DOC Encostas D’Aire. 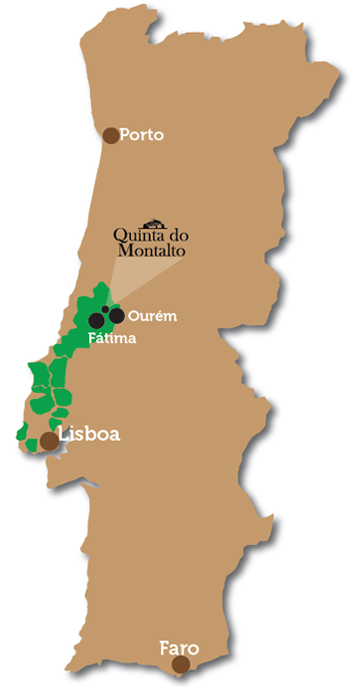 The farm of Montalto is situated in the central area of the country in the region of Ourém, near Fátima. In line with a tradition of winegrowing, several grape varieties can be found in the farm, in particular Aragonez and Fernão Pires, the most representative of the red and white grapes. We can also find the Touriga Nacional, Trincadeira, Shyra, Baga, Alicante Bouchet, Castelão, Moreto, Souvignon, Arinto, Rabo de Ovelha and Olho de Lebre varieties. In addition to fruity and delicate wines and sparkling wines, also jams, canned vegetables and vinegars are prepared in the farm of Montalto, revealing particular features quite different from those resulting of the generalised massive and technological industrialization. To obtain regional products, really genuine and with a singular taste has been the guideline for the work and dedication of both, the whole family and the employees in the farm of Montalto. Recently the first steps towards horticulture were given, thus a wide range of products are currently available, always having in mind the purpose of attaining high standards of quality. In a framework of full respect towards the preservation of the environment, all cultures in the farm of Montalto are conducted according the Organic Farming rules with control of ECOCERT-PORTUGAL, that is, the use of chemical fertilizers, herbicides, insecticides, fungicides and other synthetized chemical products is not allowed. diet, and are registered in "The Vegan Society", a UK-based association.